After watching perhaps the greatest NBA Finals I have ever seen, I was tempted to dismiss Summer League before the week even began. That Finals had six, possibly seven sure-fire Hall of Fame players, one of the greatest coaches of All-Time, and clutch shot after clutch shot on the biggest stage imaginable. Summer League in Vegas, meanwhile, had a collection of first and second year players, and actually lacked a lot of the elite rookies and sophomores for a variety of reasons. Combine that with the fact that the Pelicans traded their first round pick this year and rebuilt their team around some stellar young veterans, and again, it would have been easy to write off Summer League. In the end, I am glad I didn’t. As I said in my Summer League preview, the team pretty much knows what it has with the top half of its roster. The difference between the 10th spot in the West and a 6th or 7th seed will depend on the health of the top half of the roster and the production that the bottom half of the roster gives us this season. Remember, Greivis Vasquez and Robin Lopez far exceeded our expectations last year. Jason Smith and Gustavo Ayon exceeded expectations the year before that, and Marco Belinelli did the same the year before that. Monty Williams has done a tremendous job of finding a role for guys at the back half of the roster and giving them the confidence to thrive in that role. Now that he once again has the talent at the top of the roster, the hope is that he can continue that trend, and that entire process started here in Summer League. Coach Williams and Coach Gates got a chance to work with some returning players for the past two weeks, and once the trades went through, they got their first look at a couple of rookies as well. What’s encouraging this year, is that the guys who made up the Summer League team this year are not going to be asked to play a major role on the Pelicans when the regular season gets here. Last season, Austin Rivers looked well over his head in Summer League and in the preseason, but because of injuries and a lack of quality players on the roster, he was forced to play starter’s minutes for most of the year. Good teams take raw players and let them learn from the bench or they give them significant minutes in D-League games. Jeremy Lamb, the 12th overall pick from last year’s draft, got a total of 147 minutes last season for the Oklahoma City Thunder. Rivers got more than that in his first five games last season. Those days have come and gone, and guys like Rivers will benefit from the smaller roles and the decreased expectations. They will get to naturally grow into those roles slowly, and will get heavy minutes when their bodies and their games are ready for those minutes. Summer League is here to develop spots 7-14 on your roster, and that is exactly what the Pelicans used it for these past two weeks, and at the end of the day, their team will only be as strong as the links at the back half of their roster. Those links were heavily reinforced these past two weeks in Las Vegas. From the first time I talked Austin Rivers this week, it was clear that he had a chip on his shoulder after an admittedly poor season last year. He spent the first part of his rehab watching tape and he noticed some things that he had to fix immediately. He talked about the tendency for his elbow to pop out, but what bothered him more was how off balance he was on the majority of his jump shots. He noticed that he had a tendency to fade away unneccesarily and even on set shots, he tended to lack balance and strength in his lower body. In addition to watching tape, he “lived in the gym” according to the coaches, and as Coach Gates said, “It [breaking his right hand] might have been a blessing in disguise,” because it forced him to work with his left hand. It also allowed him to strengthen his lower body in the gym. For me, that was the biggest takeaway from this whole week. Rivers seemed much stronger in his base, and that helped him immensely on both ends of the floor. Not only was their clearly more explosion getting to the rim, but he was no longer getting pushed around on the defensive end. He held his own when bigger guys tried to post him up and he was even able to rebound with some of the bigger bodies down low when he was forced down their on rotations. As excited as we get about Rivers on the offensive end, he still has quite a ways to go on that side of the ball. He can drive left now, but he still tends to finish with his right hand on those drives. Once he can finish with his left hand, he can use his right arm and his body to shield the defender, which will make it nearly impossible to block his shot. He also needs to develop a mid-range game so that he has options once he puts the ball on the floor. Right now, he has a nice collection of floaters, layups, and finger rolls when he gets to the basket, but smarter teams will adjust to that. He will need to show that he can hit the breaks and knock down a mid-range jumper to keep the defense guessing. While he will never be a true point guard, he does have the ability to get into the lane and kick the ball out to open shooters. His quick first step forces the defense to collapse and with weapons like Ryan Anderson and Anthony Morrow on the perimeter now, Rivers should have numerous kick outs for three this year. Where he needs to improve is on his interior passing. He doesn’t seem to be able to fit the ball into tight spaces, nor does he run the fast break with tremendous efficiency. Again, a couple of things to work on, but if there is one thing we now know about Austin, it’s that he isn’t afraid to put in the work. With a smaller role on this team, not to mention better competition to go up against every day in practice, Rivers will have every opportunity to improve on his game at the correct pace. The final thing that I couldn’t ignore when it came to Rivers was his incrediblely high competitive streak. He wanted to win every one of these games, and was constantly finding new ways to challenge himself. He asked Coach Gates to cover the opposing teams’ best guard in all five games. He also seemed extremely upset after the Pelicans lost to the Denver Nuggets in the Summer League Tournament. And lastly, he embraced the challenge ahead of him when he will be forced to compete for playing time with Jrue Holiday, Tyreke Evans, and Eric Gordon over the next few months. He didn’t seem upset in the slightest with the teams’ offseason moves. Instead, he stated numerous times that he can’t wait to push those guys and have them push him every day in practice. 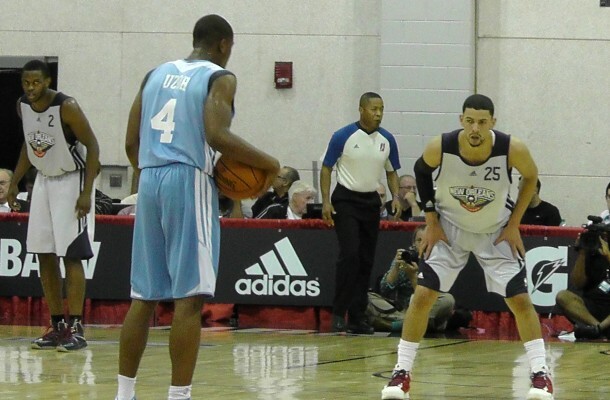 A fantastic skill set combined with a competitive nature, tremendous work ethic, and a role that is better suited for where he is at this stage of his career – all those things point to a huge jump forward for Austin Rivers in the upcoming season. Coach Gates joked earlier in the week that he, “has spent more time with Miller than his own wife since the season ended.” A large part of their focus has been getting Miller more comfortable with putting the ball on the floor and creating for himself off the dribble. Miller struggled in the first couple of games, especially when he was put in isolation or in pick and rolls. He spot-up game was good throughout Summer League, but good teams will completely take you out of the game if you can only do one thing well. If Miller is going to help the Pelicans second unit space the floor, he is also going to have to be able to attack the paint when defenders close out on him quickly. It was a big two weeks for Miller, arguably bigger than for any other player, because his contract is not guaranteed yet. The Pelicans have until the 27th to release Miller with no financial penalty. With his play, especially in the last two games, Darius Miller has probably bought himself at least one more year to show that he can be the Pelicans 3 & D small forward off the bench. After he improves on his game off the bounce, he is going to have to focus on becoming a more aggressive defensive rebounder. He has the size and the physicallity, but he doesn’t attack the glass like he should. Outside of Tyreke Evans, the Pelicans don’t figure to have an above average defensive rebounder coming off the bench, so if Miller could become one, it should go a long way into getting him some regular minutes with this team. Summer League is just as big for the coaches as it is for a lot of these players, and Gates took full advantage of his opportunity here. If you are lucky enough to talk to him for thirty seconds, you realize that this guy just loves the game, and his love for it comes through in everything he does. He runs his practices with passion and efficiency, and gives terrific direction during games. He wouldn’t give us any specifics on the plans that the coaching staff has for these re-made roster, but his eyes lit up every time we talked to him about the possibilities. The players stated numerous times that they just can’t wait to play together, and the coaching staff is equally as excited about getting started with all the pieces at training camp. Gates is an emerging coach who has the respect of the players and the ear of Monty Williams. We should enjoy this guy now, because you just never know when another team might make a run at him the same way teams went after Mike Malone, James Borrego, and Tim Connelly. Monty gave Coach Gates room to run this team the way he saw fit, but he was there at every practice and every game, giving guys notes afterwards on what he noticed. After the first game, Rivers joked that he could, “score 80 with 20 assists, and Coach [Williams] would still be waiting for a page full of things that I did wrong.” And it is true. After every game, Monty pulled guys aside and showed them something from the box score or his own set of notes. He also got down and dirty, working in the post with big man Jeff Withey several times in practice. More than anything, though, you notice a more relaxed and happy Monty Williams now that he knows that he will have the horses to truly compete. When he first saw Eric Gordon in the locker room following one of the games, the two shared a laugh and hugged. His conversations with Anthony Davis seemed incredibly optimistic and two-sided, with Davis offering as much input as Williams. Honestly, it looked a lot like what we have seen over the last 15+ years with Tim Duncan and Popovich. Williams has often said that he is looking forward to the time where he can do more coaching and less teaching. After a brilliant offseason and a new atmosphere created because of those moves, that time is here. Because of the NBA’s moratorium period and the fact that Withey could not officially be traded to the Pelicans until the 10th, he missed out on some practices that would have probably helped him quite a bit in these initial games. But with Withey, you saw several positive glimpses that lead you to believe that he can have a role on this team, as early as this upcoming season. First of all, his face up game looked far better than advertised, as he displayed a soft jumper in games and during warmups. He also showed the ability to set a terrific screen on that end, flattening several guards over the course of the week. Defensively, he was the rim protector that we all came to know at Kansas, and he was also excellent with his communication on that end. He got caught in space on that end a couple of times, and he really struggled the few times he was pulled out to the perimeter. Offensively, he also struggled with his back to the basket, and quite frankly, I don’t know if we can ever expect him to be a low post presence on that end. He figures to get most of his buckets in the pick and pop game or on put backs. He also does a tremendous job of running the floor for a guy his size, so he can get a few easy buckets there as well. Withey could play 8-12 minutes right now, but I don’t know how successful he would be offensively if asked to do so. Defensively, you would have to make sure that whoever he was covering wasn’t a threat to hit an 18 footer or put the ball on the floor and take it to the hoop. Luckily, most backup big men in the league can’t do that. Heck, very few starting centers can. Ideally, I think the Pelicans would like to sign a guy like Greg Oden and have him, Jason Smith, and Greg Steimsma eat up the majority of the minutes while Withey takes a red shirt year of sorts. Next year, both Smith and Steimsma are free agents, so a spot could open up for Withey, and with a year of seasoning, he could be a quality contributor. Roberts likes to shoot the ball. And that’s okay, because this is Summer League and the Pelicans had a limited number of scorers on their roster. It makes you wonder, though, whether he has a role on this team moving forward. With the additions of Holiday and Evans, the return to full health of Eric Gordon, and the emergence of Austin Rivers, there are guards on this roster who do what Roberts does, only better. It would have been nice to see Roberts try to be more of a facilitator, to see if he was capable of running an offense. Instead, we saw a lot of Brian Roberts 18-foot jump shots when he was playing on the ball, and quite honestly, that is not something Monty will want to see this season. Has anybody had worse luck over these last few weeks? First, Jackson’s journey was put on hold when the Jrue Holiday trade was held up because of paperwork issues. Then, after finally settling in, Jackson came down with pink eye. Instead of 5 games and 8-10 practices, Jackson only got 3 games and 3 practices with the team. Jackson struggled in those games, especially with turnovers, but the coaching staff has seen the potential, and they are excited to work with him this season. Jackson is dynamic in the open court, and his change of direction ability in the half court is second to none on this roster. He has fantastic speed, but it is his tremendous quickness and agility that gives him the ability to change games in short spurts. Like Rivers, he has a tendency to fade away unnecessarily on his jump shot, but he really elevates on his jumper and his quickness allows him to get it off whenever he wants. He also does a great job of finding big men when he gets into the lane, and his head is always up on the fast break. Overall, it was a tough couple of weeks for Jackson in Vegas, but he will compete for that 5th guard spot in training camp and he shows the potential to be a guy who can come in and change the tempo of a game in short spurts down the line. I actually would love to see Jackson get 2-3 minutes a half with Aminu and Withey sprinting down the court while Ryan Anderson and Anthony Morrow give him kick out options on the wing. A lineup like that could give your starters a rest while simultaneously having the potential to go on a nice little run. Davis could have stayed at home or went back to Chicago. He could have just showed up and sat at the end of the bench, giving the occasional high five after a timeout. Instead, he came to Las Vegas and played the role of assistant coach and team leader, and the guys really took notice. He was there with Coach Williams after every game looking over the box score. He was there with Austin Rivers, helping him work on his free throws, and he was there at the end of every practice to give an inspirational send off. He was the leader of this team, even though he never played a minute. And that will serve him as much next year as every minute he has spent in the weight room or every minute he spends on his post up game this summer. This team’s ceiling is entirely dependent on Davis and what he becomes over these next few years, and with that in mind, it was fantastic to see the role that Davis took on this week. Not only did he take on the role, but he thrived in it, and that should be as exciting to Pelicans fans as anything we saw on the court in Las Vegas. This season’s gonna be awesome. Very good read, I am really excited about our group of young players, I believe it will be a toss up between Rivers and Aminu for the most improve player on this team. Also I predict Pierre Jackson will be out Brian Roberts for the 5th guard spot. That’s really encouraging to read about Davis being a leader for the other young players. I would guess his experience with the Olympics last year had a significant effect on him. He probably learned a lot then about the value of teammate interactions, and how players take on leadership rolls within the team, helping each other. I would guess he learned that really well and is demonstrating it now. That is a really exciting thing for the future of the team. Davis is gonna make the All Star team this year… man this is gonna be an exciting year! Withey lacks the footwork right now to properly defend…doesn’t reb out of his zip code….face up game is nice with room..crowd him and numbers will drop…lets monitor him………Rivers…..backup guard….